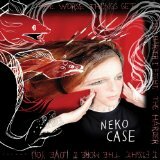 When looking at her discography, it is surprising to see that Neko Case has not released an album since 2009’s Middle Cyclone. Case is an artist who often pops up in various spots – whether it’s singing with Jakob Dylan, covering “She’s Not There” with Nick Cave or providing backup vocals for Camera Obscura, she’s never too far removed from the musical landscape. The Worse Things Get, The Harder I Fight, The Harder I Fight, The More I Love sees Case return to the solo spotlight. The soulful “Night Still Comes” and rollicking “Man” provide two early highlights that provide a mighty one-two punch. Sung a cappella, the parental failings in “Nearly Midnight, Honlulu” are truly heartbreaking as is the long distance lament in “Calling Cards”. While remaining emotionally raw throughout, a few of the tracks don’t hit with the same impact as what’s come before making for a good but at times inconsistent listen.